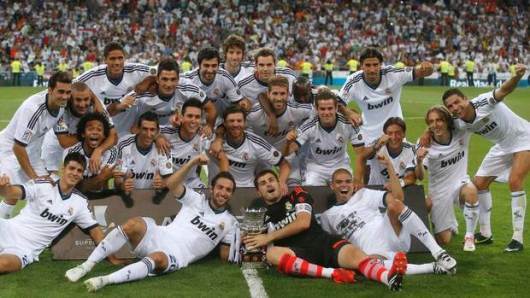 Real Madrid is a highly successful professional soccer team based in Madrid, Spain. 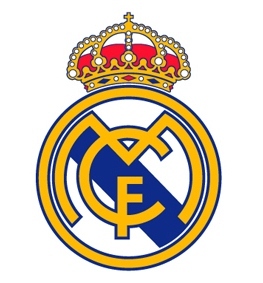 The team, originally named the Madrid Football Club, was founded in 1902. The club was renamed Real Madrid in 1920 by King Alfonso XIII, who bestowed the club with the name real (the Spanish word for royal – pronounced “ray-al”) along with the crown that appears in the team’s coat of arms. Viceroy is a Spanish-owned company that values its partnerships and ambassadors; in the sports world, this includes F1 racing champion Fernando Alonso. Like Real Madrid, Alonso is Spanish and among the very best in his sport. The relationship between Viceroy and Spain’s most celebrated football club is, therefore, quite fitting. The men’s Chronograph is the most intricate model in Viceroy’s Real Madrid Collection. (Other versions are simpler time-and-date models.) A handful of details tie the legendary club to the watch, all of which are subtly integrated. Two of these details appear on the dial: the most overt is the team (and watch) name – Real Madrid – which sits beneath the 12 o’clock marker. The other is something that perhaps only a fan would recognize: the blue color of the dial is similar to the blue that appears in the team emblem. A more decisive connection to the team appears on the solid caseback, where the Real Madrid coat of arms is engraved. The name Real Madrid appears once more on the strap buckle. 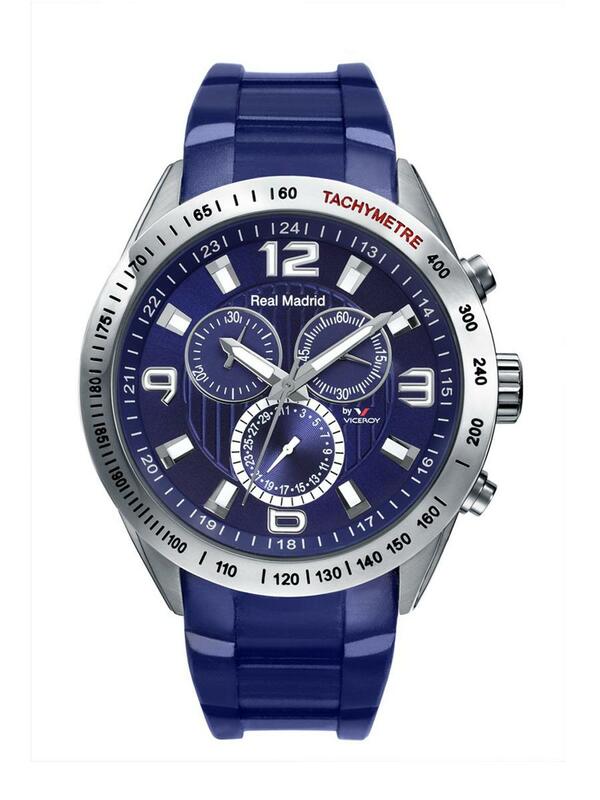 The watch itself is an assertive sport watch with a 43 mm stainless steel case that is water resistant to 165 feet. The rich blue color of the dial, visible beneath the mineral glass crystal, changes slightly depending on the light. Plenty of polished steel, as well as white and silver accents give the watch a modish and tasteful appearance, as does the addition of a matching blue rubber strap. Two complications are represented on the dial: a chronograph and a small pointer date. The chronograph has a central seconds hand, and at 10 o’clock, a 30-minute sub-dial. Its opposite sub-dial at 3 o’clock tracks constant seconds. The stationary bezel features a tachymeter for use in combination with the chronograph to track speed over an elapsed distance. The sub-dial at 6 o’clock is the pointer date. A thick white track surrounds it and differentiates it from the chronograph sub-dials. The numbers and hour markers are large and coated with luminous paint, as are the hour and minute hands for good legibility in the dark. A 24-hour track is printed on the outside of the dial for quick reference. In addition to blue and white, watches in the Real Madrid Collection also come in black and red – the colors of Viceroy. Every watch in the collection is powered by a reliable quartz movement. For every fan of the Real Madrid football club, the Viceroy Real Madrid Collection is a brilliant accessory to the legend. For others, the watch is a cool and rarely glimpsed addition to any watch collection. Purchase your new Viceroy watch from an authorized Viceroy dealer.